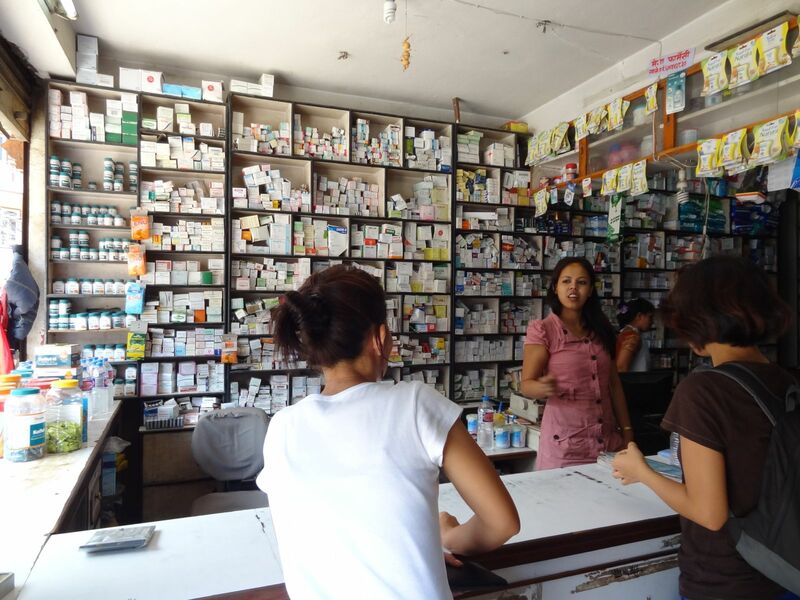 In Nepal, you cannot get medicine, even aspirin, unless you go to a clinic or a pharmacy. Not wanting to endure the whole doctor/clinic/language/culture barrier thing while sick, I set out for the pharmacy. Fortunately, I vaguely remembered from my last visit where there was a pharmacy, and indeed it was still there. On the wall behind the pharmacist you can see the medicines stacked in bins. You simply describe your symptoms to the pharmacist (do they really understand English that well?) and he or she pulls out a box from some shelf, opens it up to reveal a number of foil sleeves, and asks you how many you want. I got 10 aspirins (or some aspirin-like substance) and 10 “digestive enzymes,” (for my pharmacist brother and sister-in-law, that would be Pancreatin/Hemicellulase (Aspergillus Niger)/Ox Bile). I don’t really know what it is and I don’t want to. At some point, one just has to trust that people live here, get sick, and this is how they get better, so it is my best shot. You pay your money and you take your chance, and not much money. Less than $1. The next day I had recovered enough that I could eat two pancakes for lunch. By supper, I had a whole plate of food. I wouldn’t say that I am well, but being back to “functional” feels good. So was it the medicine, or just the time that heals? I don’t know, but it feels good to have weathered that storm and come through it intact. It gives me more confidence that all will be well.